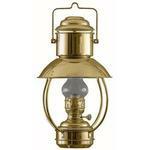 The Copper Wall Anchor Lamp is hand made to commercial ship standards. It is made of an oxidized antique copper finish with a unique amber color and individually blown glass lens. Its lasting beauty and timeless design will enhance the decor of any home or ship's cabin. The bulb is included. It uses regular 110v electric with a 60 watt maximum. Bulb included. Wt. 7.9 lbs. 110v electric, 60w max. Bulb included.